Though I could stand at the lectern and compare my students’ first days at Lenoir-Rhyne with those of freshmen beginning college at a flagship state university, or a regional state university, or a community college, or an elite liberal arts college, Declining by Degrees sends them to classrooms at schools different from their own. That alone serves as one practical reason to continue showing it: I cannot put my students in other students’ shoes, but the film can. Nevertheless, the naysayer in me utters, it’s ten years old now. It’s dated. I have chosen to quiet that voice in my head that tells me no, because the problems that the film addresses persist as college costs continue to rise faster than the rate of inflation (Lorin). And as more and more students find themselves burdened by debt, it’s critical for them to be able to place their college experience in a broader context and consider not only the financial costs, but the educational and social ones as well in a system that enables students to tread water, as one of the students in the film, Robin Bhalla, does. Bhalla, in his own words, was a student who was “working with” or “manipulating” the system. Even though he partied four or five nights a week and his course work was only an afterthought, he still maintained a B average. The students who concern many faculty and administrators the most are ones like Bhalla who tread water, fulfilling course requirements and graduating without the intellectual development their diplomas should represent. Yet despite the film’s focus on treading water as a problem, many students who view the film don’t see it as one. In fact, they don’t even see it as treading water. Bhalla did move forward, some of my students have pointed out. In one of the class discussions following a viewing, a student referred to the “good job” that Bhalla obtained after graduation, though the film’s narrator, John Merrow, didn’t mention any specifics about Bhalla’s job at a pharmaceutical company. For some students, Bhalla’s job translated as good because they believe that people who obtain Bachelor’s degrees will eventually find good jobs and people who don’t, won’t. Thus, they conclude that Bhalla’s approach to his college years wasn’t a problem because he did graduate with a B average and did get a “good” job. Understandably, many students entering college don’t recognize such flaws in reasoning, but instead focus on the flaws in a system that requires them to pay ever-increasing sums of tuition for courses they perceive as irrelevant to their careers. Yet even students with tunnel vision can see much of what’s wrong. Why should they devote time to courses that we tell them they need, if what they see is lecture halls where the professors don’t know their names, where it doesn’t matter if they don’t show up for class, where the professors don’t encourage questions from students? One such professor, Paulette Kurzer, at the University of Arizona, claims she cannot answer students’ questions in a large lecture class, maintaining with students an unspoken contract that she calls “You-don’t-bother-me-and-I-don’t-bother-you.” Throughout the segment of the film devoted to her political science classes, she expresses her concern about students’ lack of engagement without recognizing how her own approach to teaching may encourage the very apathy that’s the source of her complaint. When the film’s narrator John Merrow suggests to Kurzer that students aren’t interested in classes like hers because the professors are boring, some students in my classes have laughed at Merrow’s blunt honesty, perhaps wishing they could similarly act on instinct in their classes without the risk of negative repercussions. In class discussions of Kurzer, my students have acknowledged her shortcomings and those of her students’ alike, but often haven’t seen the disconnect between Merrow’s assertion: “You’re boring,” and Kurzer’s response: “The students know how hard I work on my lectures.” Just as devoting hours to planning a lecture doesn’t guarantee its success, devoting hours to writing a paper or studying for an exam doesn’t guarantee a successful outcome. Kurzer’s staunch belief in her unacknowledged success in the classroom isn’t very different from many students’ self-perceptions. If she mistakenly believes that she has earned an A, why shouldn’t they believe that they have earned A’s, too? Paulette Kurzer’s and Robin Bhalla’s stories, along with those of the other professors, students, and administrators on screen, reveal that the problems in higher education aren’t limited to one facet of the university; they’re systemic. But the message that some of my students at Lenoir-Rhyne glean may be quite different. They may see the treading-water approach as a big-school problem, one they have now seen on screen at the University of Arizona, and Western Kentucky, and the Community College of Denver but will not witness in their own classrooms. But Robin Bhallas and Paulette Kurzers are here as well; small classes alone don’t insure that students and professors are engaged and accountable. On the first days of class we could have viewed any documentary and subjected it to the analysis that’s integral to our course. But Declining by Degrees, though now a decade old, claims us in a way that few other films can. Watching scenes that reveal problems that persist in higher education means watching ourselves, not mirror images but traces, and the challenges and risks that we as students and professors continue to face. Declining by Degrees. Dir. Robert Frye. Narr. John Merrow. PBS Video, 2005. DVD. Lorin, Janet. “College Tuition in the U.S. Again Rises Faster Than the Rate of Inflation.” Bloomberg Business. Bloomberg, 13 Nov. 2014. Web. 12 Sept. 2015. Interesting piece. Makes good sense to show the film even if the clothes are out of date! Seriously, these problems remain and it seems a good way to address them. Thanks. Thanks, Lenore. 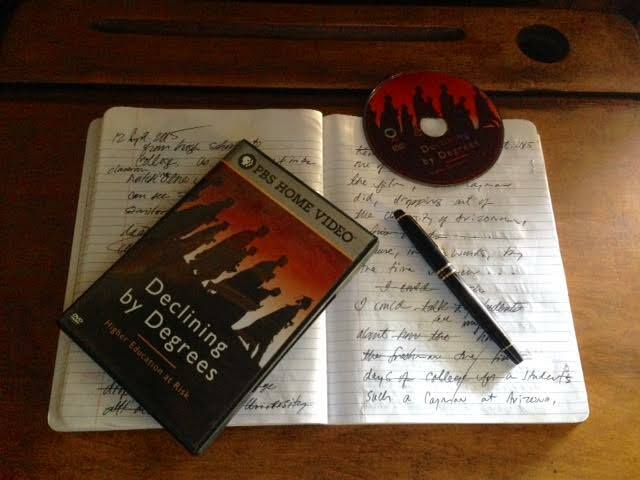 Though the problems remain, I do wish that I could show a more recent documentary that’s as comprehensive as Declining By Degrees. Perhaps PBS will produce a follow-up.